When I started to read this book, it became obvious that the book I was reading wasn’t the book I was expecting! It was so much better! When I finished it I felt lost, an unexpected reaction to the heart wrenching tale I had just experienced. It’s not a book to rush through to discover the mystery at its core, but a journey to savour and let the characters and their circumstances resonate with the many different emotions evoked. It’s a story that once it entwines itself around your heart, won’t let go! I loved every minute of it! Christopher Drayton has been found dead at the bottom of the Scarborough Bluffs and Esa Khattak and Rachel Getty from the Community Policing team have been brought in to investigate if he fell or was pushed. When suspicions are raised that he has been keeping his real identity a secret, everyone becomes a suspect. The question raised here is whether his past crimes means that his death is deserved. Has justice at last been served? This is a harrowing read at times and the quotes at the headings of the chapters were so powerful that they gave me goosebumps and the weirdest feeling that I was walking through a graveyard. I felt the silent respect for the dead spreading throughout the narrative, haunting the living with their stories of loss and despair. It truly is a heartbreaking read at times. But it’s held together with the vibrancy of its characters, especially the female ones. Rachel grabbed my attention immediately with her determination and forthright manner and I found her partnership with Esa to be subtly understated but also able to convey lots of emotions without actually saying much. This is a intelligently written and cleverly crafted mystery that grabs your attention straight away. It’s a stunning debut that is worthy of all the fabulous reviews that I’ve seen. And thankfully I’ve now discovered there is going to be a second Khattak and Getty mystery which I am over the moon about! I like this pairing and I’m keen to see how the author will develop them and their relationship further. Highly recommended by me. The Unquiet Dead (Detective Esa Khattak and Rachel Getty Mysteries) is available to purchase now at Amazon UK. 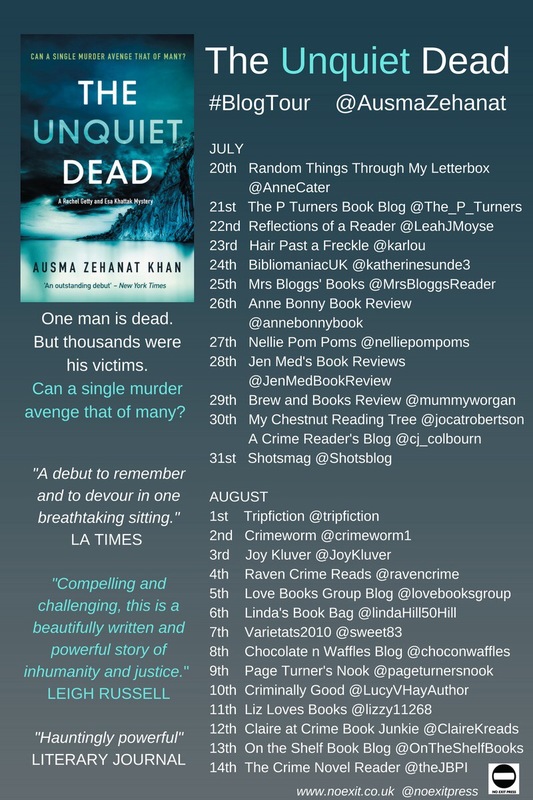 Check out the book, The Unquiet Dead, by Ausma Zehanat Khan, as featured on the My Chestnut Reading Tree blog.